Our continuing education course is designed to give water operators in North Carolina the education that they need to qualify for a renewal of their license. Water operators who take our course should expect training that is written by experts and is both informative and interesting. What are the CE requirements for North Carolina water operators? Complete your 6 Hours of Professional Growth Hours (PGH). Submit your Certificate of Completion to the North Carolina Division of Water Resources by December 31st along with any additional required paperwork. This 6 hour course will provide water operators with the PGH they need to renew their North Carolina water operator license. Enroll and take your required PGH anywhere, at anytime, from any connected device. 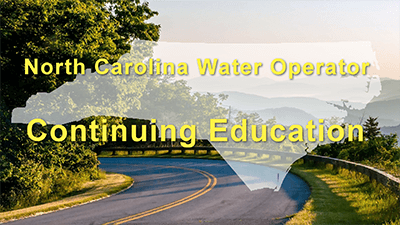 The North Carolina Water Treatment Facility Operator Certification Board's pre-approval committee has reviewed your application regarding continuing education courses for drinking water treatment operators. The committee is pleased to inform you that your request for pre-approval has been approved for the following course(s). Approval for the course(s) listed above will not expire unless there are deviations from the submitted information (including instructor and/or course content). Information regarding your approved courses will be posted on our website to assist operators in their selection of professional growth education opportunities. As a training provider, you must submit an attendance roster via internet within 15 days following completion of training modules by operators using your online services. Please feel free to call me at any time should you require assistance or have any questions.